Absurdia is a strange and wonderful land, a place where nothing is quite what it seems. Umbrellas are trees, meals are all mixed up and pillows are hills. it is all very odd. 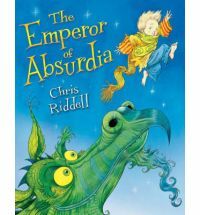 Join the Little Emperor as he searches for his lost snuggly scarf and sets off on a dragon hunt. A delightful story set in a strange and somehow appealing dreamscape. The story is fun to read and the illustrations are detailed, a little odd and bring a joyful smile to my face. I’m sure we all need something a little absurd in our lives from time to time. Oh and watch out for the Wardrobe Monster.